The comedian shares his history with Marvel Comics ahead of this week's X-Men: Black - Mojo #1! Tony Stark inspires people to become inventors. Carol Danvers inspires people to become pilots. Frank Castle inspires people to keep an eye on their kids in public. The real world power of Super Heroes lies in how they move us to be better, to reach higher. And for many professionals across the entertainment industry, Marvel Comics have served as a major early influence on their creative journeys. This is what led me to a conversation with comic book lover, host of Comedy Bang! Bang!, and writer of tomorrow's X-MEN: BLACK - MOJO #1, Scott Aukerman. To find out how Marvel has inspired him creatively, I channeled Professor Charles Xavier. So I sat down. And then I got inside Scott’s head with this interview. Marvel.com: What were your earliest experiences with Marvel Comics? What books do you remember first reading? Scott Aukerman: At a certain point, I was getting the big treasury comics at the grocery store that had reprints of Fantastic Four #1, the Impossible Man story, #50 with Galactus… Those were sort of my introductions to the characters—these reprints of old issues—not necessarily the comics that were current, until probably the ‘80s. In late elementary school, junior high, that’s when my collecting was at its peak. That’s when I started really getting into all of the Marvel stuff. I mean, you have the Uncanny X-Men, you had John Byrne and Chris Claremont on it, and you had Roger Stern on Spider-Man. And then John Byrne going over to the Fantastic Four. Those were like the early ‘80s through 1987 or so; that was my prime collecting period when I was a kid. Marvel.com: Who were your favorite characters? Scott Aukerman: Spider-Man was definitely my favorite. I always really, really wanted to be able to read every Spider-Man comic up until the present day, at the time. But all we had at the time really—unless you could find back issues—were the pocket book things that I believe reprinted up to like six issues at a time. And they reprinted up to like issue #35 or something. And then you also had Marvel Tales, which I believe reprinted all of Spider-Man’s appearances, but then they would also change the dialogue in it. Change any ‘60s references into ‘80s references, y’know? [Laughs] Which really bothered me. Yeah, I was really, really into Spider-Man and really into the Thing. The Fantastic Four and X-Men. I can’t say that I was really obsessed with Wolverine or anything. I thought he was fine. For the most part, I enjoyed the X-Men as a whole, rather than any of the specific characters. But I think I really got into the pathos of Spider-Man and the Thing. Their tragedies somehow appealed to me. Marvel.com: How did those stories influence you as a young person with a burgeoning interest in writing and performing? Did Spidey help inspire your interest in comedy? Scott Aukerman: I definitely really would laugh a lot when I would read Spider-Man comics. That was always a gauge to me of how successful a writer was at writing different eras of Spider-Man. When it got too serious or melodramatic, I wouldn’t enjoy the book. You know, the writers that I have really loved in Spider-Man—Stan Lee, Roger Stern, Dan Slott, Brian Michael Bendis—they’ve all embraced the funny side. I think Chip Zdarsky is doing really well with that, too. That’s a very important side of the equation for me in reading those books. That’s what I gravitated to when I was young was this combination of humor and soap opera. Which is very important when you’re making anything—not letting the balance tip too far on either end of it. You have to be funny enough that it’s an enjoyable read, but you also have to really hook people into what the characters are going through. When I started examining why I enjoyed certain seasons of The Simpsons, why I didn’t enjoy other seasons of The Simpsons, and I would be talking about it with friends, I really started to realize that the thing I really appreciated about certain seasons were the ones where the emotional stakes of the characters were very real to me. The seasons that I really loved were the ones where they weren’t so crazy that you were losing why the characters were doing anything that they were doing. Marvel.com: That, I think, leads perfectly into this issue of X-MEN: BLACK. It's super funny, but there's definitely a character arc that emerges for Mojo here. What did you set out to do with this issue? What ideas did you want to explore with Mojo? Scott Aukerman: In most of the comics that I’ve done, I have to figure out what the character is going through first. When Jordan [D. White], my editor, assigned me Mojo, I had to admit that it was a character that I had never necessarily gravitated towards. So I went back and read a lot of his appearances and tried to figure out why that was. For me, I found that the reason I wasn’t necessarily enjoying him that much is because I felt like, for most of his appearances, he didn’t have a lot of clear emotional stakes that he was going through. He was merely a satirical character. Something that I talked to Jordan about when I had met him a few months back was how there isn’t enough romance in comics anymore. I think the combination of fighting and interpersonal dynamics is really what I love about the Marvel style. When I was thinking about Mojo, I said, well what can he want? But then I also had this other idea that, as I was looking at these pictures of Mojo, just how the shorthand for how evil he is, is how ugly he is. So the grotesqueness of the character is like a visual shorthand to tell young people that this is a character who is as evil as he is ugly. Like, what a bummer for ugly people! [Laughs] You see it pop up everywhere. You see it in Lord of the Rings; Gollum is ugly, so he’s evil! You see it in so much fantasy fiction. Anytime you see anything really, really ugly, you’re afraid of it. I just felt like ugly people are getting such a bad rep. Because we can all feel ugly, you know what I mean? I don’t think that should necessarily be equated to someone’s inherent goodness. 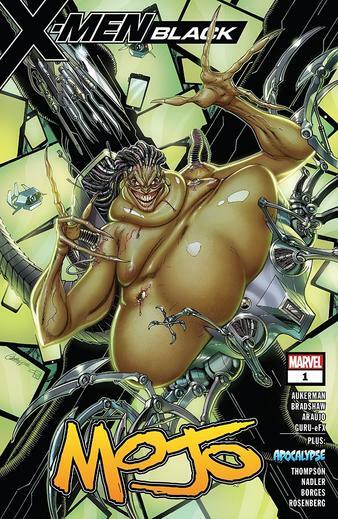 Marvel.com: Which is why Glob Herman is the perfect foil for Mojo in this issue. He’s like the Thing to me. Like, what a terrible lot in life to be so grotesque, but he’s such a good character and he’s such a nice person. It really just kind of popped into my head, that it would be interesting to see these two together; to see someone who is as hideous as Mojo but has a bright personality and keeps an optimistic outlook on life. That was a really interesting learning place for Mojo, in a way. So I got very excited about that possibility. It’s interesting because every comic that I’ve done, I’ve thought of the major interpersonal part of it first. And then after that, said to myself, “Well, you know what, this is going to be boring for an artist.” [Laughs] Like, “I need to throw some action in here.” But stories like this are essentially about characters making changes, however incremental. Marvel.com: I’m really interested in the relationship between comedy and narrative in that way... When you’re writing, are you always conscious of the character stakes at-hand? How do you maintain the right balance there? Gerry Duggan once said to me, “The hardest part about doing a comic book is finding excuses for why people are hitting each other.” And you really have to figure those things out. It can’t just be like, “Well, I want to take over the world.” Okay, why? “Well, anyone would want to take over the world.” They do? I don’t want to take over the world! It’s really about figuring out these reasons for why these people are doing the things that they’re doing—which is, by the way, what's great about the X-Men. The X-Men have always been this allegory for the oppressed. There is always a lot of really great personal stuff to use. Marvel.com: Right—they're the ideal group for exploring these ideas. Scott Aukerman: That’s why I start getting really excited about this particular story, when I start thinking about not only the fact that Glob and Mojo are both ugly, but also the human aspect; how to humanize them. I just start thinking about that in regards to all people who are feeling like they’re not considered human beings in the eyes of the people who want to oppress them. I think that’s sort of the theme of this book—the more you get to know someone and don’t see them as a stereotype, the more likely you are to not be able to oppress them. 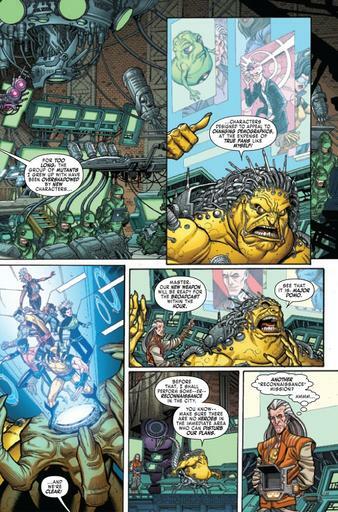 Mojo is less likely to be able to actually enact his plan of killing the X-Men when he starts seeing them as actual people. I think that’s what the X-Men are all about. Visit your local comic shop tomorrow to read Scott Aukerman, André Lima Araújo, and Nick Bradshaw's X-MEN: BLACK - MOJO #1!